London Underground dispute: defend our union! SWP slogans: "General Strike" or general nonsense? Defend our right to protest! Mobilise against these racist thugs! Demand that Labour defy the cuts! "The future of the National Shop Stewards' Network"
As the battle over jobs continues, RMT members on London Underground are preparing to take action to defend two union reps from victimisation. A favourite theme of those who trade in lampooning the left is to reduce our ideas to mindless sloganeering. These scribblers conjure some ridiculous caricature and then knock it down with ease. The influence of these exercises is such that some people turn out on demonstrations with their own home-made placards, daubed with semi-ironic slogans like “down with this sort of thing” or “I’m really angry”. Unfortunately, these creative individuals are consistently swamped by equally ridiculous but apparently earnest placards and leaflets. A briefing on the BBC website gives stark figures on the new university fees policy which, if introduced, is set to take effect from September 2012. We were discussing taking some kind of radical direct action for a long time before we went into occupation. We had a democratic meeting on a Saturday, which involved a lot of different groups and forces. We discussed what kind of action we wanted to take and decided to go for an occupation. We thought about some demands we’d like to raise and used the Sunday to make flyers, make banners and build support amongst activists for the idea. On Monday we want into occupation. Between 22 November and 2 December, nine members, supporters and friends of the AWL took part in a solidarity delegation to Israel and Palestine, visiting Palestinian resistance organisations, Israelis supporting them and workers’, youth, women’s, anti-occupation and solidarity organisations in both countries. Sacha Ismail discusses some of the political impressions he had during their visit. On 9 December parliament voted in favour of a massive hike in tuition fees. We cannot accept that as decisive defeat! In 2006 the movement against the CPE law in France, which would have allowed bosses to summarily sack workers under the age of 26, continued after the French parliament passed the legislation and eventually forced its repeal. It can be done! Forcing the government back means maintaining momentum, and that means reaching out to a wider working-class resistance to the cuts. The gulf between what happened on student protests and what is reported by the mainstream media is reaching absurd proportions. On 9 December march everyone could the utterly contemptible behaviour of the police. 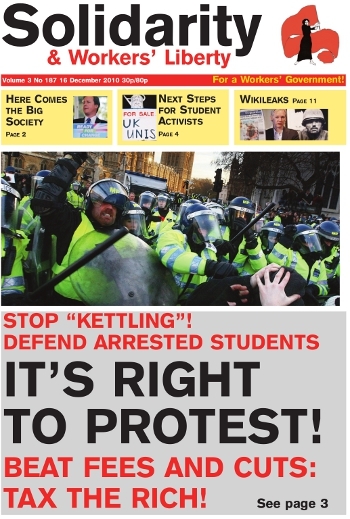 But rather than focus on that, or on the fact that a Bill to make higher education all but off-limits to poorer students was passed in Parliament by those who got their education for free, the media decided that the real problem was the protesters having the temerity to stand up to the government’s ideological marketisation of and cuts to higher education. Police brutality and violence matching the vicious, unrestrained ideological attacks of the Tory-Liberal government was dished out in ample portions to protesters at the student demonstration on Thursday 9 December. Trained in the brutal arts of defending the state, wearing the best protective head gear and steel toe-capped boots public money can buy, and brandishing offensive weapons, the police lunged into crowds of protesting students, randomly and indiscriminately beating anyone in their way, including a protester in a wheelchair. The English Defence League will return to the streets of Luton on 5 February for what they are billing as a “homecoming” demonstration.